This collection contains primary documents that trace the shift in New York State’s public policy that would ultimately lead to the 1961 consolidation of New York City’s handful of municipal colleges into one coordinated system: The City University of New York (CUNY). The new unified CUNY, which would allow for the system’s subsequent growth, was largely a product of public policy addressing a series of demographic, political and economic changes in postwar New York City. Through several reports and state legislation, the collection tracks NYC’s attempt to respond to increased demands for public higher education institutions. Since the founding of the first municipal college (what would become City College) in 1847, the residents of New York City had been provided with public access to tuition-free, college education. The municipal college system had grown slowly over the following century, totaling only four separate senior colleges (City, Hunter, Brooklyn and Queens). After the Second World War, the demand for access to public higher education began to accelerate in NYC as it did across the country. New York State laws passed in the postwar era emphasized community colleges as a major avenue of expanding access to higher education. Between 1946 and 1961, when CUNY was formally launched, the municipal system added four community colleges (NYC Tech, Bronx, Queensborough, and Staten Island). A 1948 state law mandated that in order to receive state funding a third of the financing of new community colleges would have to come from student tuition; the rest of the operating budgets were to be paid for by local governments. Bronx Community College, for example, which opened in 1957 marks the first time a municipal college received state funding as well as the first time that full-time students are charged tuition. Simultaneously CUNY’s four-year colleges were experiencing a fiscal crisis and began to appeal to the state for additional fiscal support. Nelson Rockefeller’s election as governor in fall 1958 signified another turning point in CUNY’s evolution. In order to meet the growing demand for higher education across the state, the governor appointed a committee to make recommendations to the state system of higher education. Led by Harold Heald, the committee’s report (included here) was published in 1960. At the same time, the city crafted its own response to the increased need for higher education, launching the Holy report (also included here) in 1961. Both reports concluded that New York City needed to consolidate its independent colleges to meet the growing demands. These events led to the Education Law of 1961 that established The City University of New York. At the same time, the law also repealed 1926 legislation that mandated free tuition at all public higher education institutions in the state, and replaced it with a student financial aid program. This new program also benefitted students attending private colleges in the state. Now that free tuition was no longer legally mandated, local advocates of the municipal colleges feared that the newly consolidated CUNY system would institute tuition. These policy changes, which led to creation of CUNY and thus new educational opportunities for New York City residents, also made free tuition a point of political contention. This collection offers a historical lens into some of the current issues that public education in New York continues to face. There are 7 items in this collection. 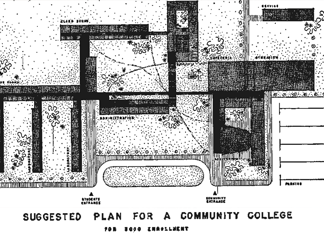 "A Long-Range Plan for the City University of New York, 1961-1975"
Go to all 7 Items in collection.